Along with Sherr, Federation's officers and Board members will also be installed. 9101 NW 57 St., Tamarac. will adjourn at 1 p.m.
stay there for some time. Mission to Romania and Israel. vice for housebound lonely people. According to attorneys Brian J.
ference of State Trial Judges. to the city's Advisory boards. and they have three children. Zion; and Iris Gersh, administrative secretary, Bnai Zion. life around the world benefit." chairman; and Leroy Raffel, guest speaker. Tower Club, One, Financial Plaza. the end of October 1986. Agency and Sunrise Musical Theatre Box Office. Sobel of Fort Lee, N.J. about her childhood in Poland and Russia. drifted from the piano above the hum of conversations. Suddenly, a new melody caught my attention. "That's 'Rozshinkes Mit Mandlen', "I said to my husband. player," I said, determined to get to the bottom of this mystery. casually, "What was that song you just played?" "No, she laughed, "but I like Jewish music." recede from my memory as if they all happened to someone else. past into the present, and I'm a small child again. wrinkled bubbeh as she sings me to sleep. the bloody craters, communal graves. to supplement out meager rations. the lullaby that I loved so much. That was a perfect description of my bubbeh. his family live in the Soviet Union. youngsters in the Soviet Union. Soviet twin, but received no reply. A Special Time For Novoseletsky Family .. .
taught to speak it in kindergarten. care about them and haven'! number of isolated elderly and families in need. dent Dovid Rappaport, and Rabbi Yossi Denburg. his family permission to emigrate. Jewish leaders in South Florida. Millions now are sought. . The best we can afford . For if we don't, who will? pus, 6501 W. Sunrise Blvd. library/learning center. It is a dream that has finally come true,"
general education as well as a Judaic one. stays at its current level for the next year. Powerline Road and SW 10 Street in Deerfield Beach. to say we're sold out for this Summer. apts. available for Summer rentals. the Waldorf Astoria in New York. next year as they enter kindergarten at the Hebrew Day School. and Marilyn Kirsch, right, class teacher. by the Federation/UJA annual campaign. the reunification of the city." ing Up: Jerusalem and Aliyah,"
Area Teens Trace Their Heritage . you are making your own. February, late April and June. signed up for the fall. who have chosen to live in Israel. books, records, etc. are needed. Billy Reimer and Jeff Stone. with the best security in the world is El Al. blackmail us and cause Israel's economic ruin. vited to spend it with an Israeli family. aayjrom 1 to 4 p.m.
Joe Robbie and Wolf Blitzer. ideas on a variety of subjects. rorism: It's Effect on Our Lives." wills, trusts and estate planning. dent of the Jewish Federation of Greater Fort Lauderdale. nership with Israel's brave people. and a tree planting in the Negev. Albany College of Pharmacy, St.
tion/UJA has a place for you. families in need live in our midst? vah program" for Passover '86." May 31, 8:30 p.m., Soref Hall,"
Volunteer of the Year Award. Save 25C on ALL Syfo Packages. said product or rl tfle coupon ina ltd pronrWed or requiri"
The purest alternative to thirst. Lydia Golden and Esta Ross. ners by Nov. 1, 1986.
gourmet meals daily and cocktail parties, too. when we entered the unique State of Romania. tion to those persons in need. 1967 approximately 800,000 have left Romania. market, not many things are available. to Romania and Israel in the next issue. low price of oil and coal. suggested that any nuclear jnnovatiy.e use* /u ">"*<<. life has finally arrived.. .and so have you! You'll jum hoi* to come and tee that beautiful eou*vSouses for joundf. Today'. chairman of the United Way. vice Award presented by Jewish Family Service in 1983. Daniel Tishberg, Ethel Waldman and Bart Weisman. Re-elected for a one-year term are Walter Bernstein and Sol Schulman. Krantz, Sigmund Nathan, Morris Small and David Sommer. Libros, Saul Padek, and Jordan Snyder. Air Conditioning and Color TV. am), and Dinner (from 630 to 830 pm). in the way of fun! 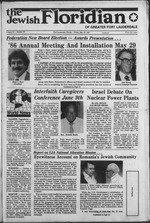 Lauderdale Free Sons of Israel. Hecht, Hope Bernstein and Susan Leonard. modations, duty-free shops, and more. and seven nights packages also available at bargain rates. Daily flights to ABC's depart Miami at 2:00 P.M.
Jte'V Your Ttavel Agent Knows! Dalet Class of the Torah School. the Rabbi" forum. At Temple. tion I: 7:80 p.m. Show. Dr. N. Donation $4. 742-5150. Sorgi Trio featuring Candi Scott. Auditorium, 3060 NW 47 Terr. Breakfast. Nob Hill Rec. Center. Center, 4780 NW 22 Ct.
Margate Library, 5810 Park Dr.
book report on, "The Lady." Somerset Phase I Rec. Room. JCC: 7:30 p.m. Annual Meeting. 6501 W. Sunrise Blvd. 792-6700. Cafeteria, 3407 State Rd. 7. 160 NW 170 St. 474-2280. Meeting. Home of Mr. and Mrs.
director Ken Bierman, will speak. square in its place, the Simon Wiesenthal Center was informed. the Georgian Republic, was slated for demolition. a great adventure to Asian Jungles. daughter of Roberta and Dr.
Silverman, son of Mr. and Mrs.
ing May 31 service at Beth Israel. 1- What is an omer? 7- Who is Bar Yochai? tomb on the mountain of Meron? to freedom of the soul. of schools throughout the land. "Sefer Zohar" (Book of Splendor). who are given their first hair-cut. Imagine WBter thai tastes fresh and dear as a spring. Friday May 16 at Kol Ami. May 17 service at Kol Ami. will be a direct flight to and from Israel. York on "Lesbians and Gay Jews in the Jewish Community"
of national Jewish organizations was held April 30 here. restless odyssey to find happiness. since price controls were lifted in 1981, an industry expert said. the means to emigrate those who wish to do so." TAMARAC JEWISH CENTER (721-7660), 9101 NW 57th St., Tamarac, S8821. dairy 8 a.m.; Sabbath 8 p.m.. Sabbath morning 8:46 a.m. Rabbi Avraham Kapnak. TEMPLE BETH ISRAEL (742-4040). 7100 W. Oakland Park Bird., Sunriat, 88818. Blvd.. Daarfiald Baach. 88441. Sarrieaa: Sunday through Friday 8:80 a.m., 6 p.m.
TEMPLE B'NAI MOSHE (948-6880), 1484 SE 3rd St. Pompano Baach. 38060. Sarrieaa: Friday 8 p.m. Caatar J.kadek Heilkrau. TEMPLE SHA'ARAY TZEDEK 741-0296), 4099 Pine laland Rd., Sunriat. 38821. NORTH LAUDERDALE HEBBEW CONGREGATION (722-7607 or 722-2722). TEMPLE OHEL B'NAI RAPHAEL (733-7684), 4861 W. Oakland Park Blvd. 8 a.m.. 6 p.m.. Saturday 8:46 a.m., 5 p.m. Caatar Paal Staart. f*" *M ** *** **: ". *taaaji faUavriag earrieee; Waaaaa. Taeeday. 8 p.m. RaaM Area Liakanaaa. YOUNG ISRAEL OP DEERPTELD BEACH (421-1867), 1880 W. Hillaboro Blvd..
DaaraeM Baach. 88441. Sarrieaa: Sunday through Friday 8 a-m. and aundown. Saturday 8:46 a-m. and aundown. TEMPLE EMANU-EL (781-2810). 8246 W. Oakland Park Blvd.. Uuderdale Lakes. day 8:16 p.m.. Saturday 10:30 a.m. RakM SkaMaa J. Harr. Caatar GaaeCarkan. in terms of religious leadership." ago by Rabbi Mordechai Kaplan. of life as well as a religious faith. that weekend, June 1 and 2. Israel, M.P.O. Box 011191, Miami, FL 33101.
in Broward, Dade and Palm Beach Counties. Dance. Relax by the pool. Play bingo.